The art made in an Art Therapy session is often messy, chaotic, even terrifying. It can appear tangled up, squashed, splatted, spilled, torn or even destroyed or binned. The mess left behind in a finished session is equally creative. The creations can be made quietly or extremely noisily depending on the meterials used. The artwork can be large or small, cold or warm. The work can be shiny/glittery or dull, rough or smooth. It can be plain and simple or complicated.Many colours can be used in Therapy or simply one colour. The mediums used can be varied. They can be traditional paper, pencils, paints, modelling mediums collage or digital media. Art can be transient in nature i.e. singing or speaking. Sand and water can be used if it is provided. Art created in an Art Therapy session is rarely censored as it is a way to understanding where the client is at with his or her feelings. The work will have different meanings to the client at different times. The work is different from week to week, even if there is a constant theme appearing as the sessions progress. Art Therapy art does not need to be finished at the end of the session, it does not have to be finished at all. The journey of making the art is the main part of Art Therapy. Art is not taught in Art therapy sessions but advice on how to use the materials may be given. Art Therapy work can be directive or non-directive. Directive Art Therapy is where the Therapist suggests a theme for the person or group. The client(s) can respond by creating some work. Non-directive Art Therapy happens when the therapist abstains from giving themes to the client(s). The work is totally client centred. Art Therapy is work. Work for the client and Therapist. Both the Therapist and client(s) work and process together through all the complexities that come out of the art. There are powerful therapeutic benefits to adding colour to things. It is very relaxing and it can train hand and eye coordination. It can help a person to focus in the here and now. These books can be coloured in or shaded in any way the user likes. The user still has choices on what to use in the colouring book. These books are indeed personal to the person using them. The person is caring for themselves when using these books. This activity can be done alone or in groups. Using colouring books can promote wellbeing too. They can be seen as a pleasant distraction. Different media can be used in these books. Children readily take to a colouring book as they are still developing language and physical skills. Creativity seems to come naturally to children, and will want to create from a blank canvas. Anyone can use these colouring in books. Many of us had used such books as children and using them again can bring back memories of childhood. Adults can give themselves permission to use the books. Colouring books are beautiful to look at, pleasing to the eye and allows the user to want something to look pretty. There seem to be something safe and reassuring about using colouring books. They are portable and can be picked up and put down at any time. Colouring books can channel energy into doing something creative. The imagery is pre-planned, so there is no need to think about drawing or painting from scratch. The pressure is taken away from the person to make an image from a blank canvas. Someone else has created the image. Colouring books are definately therapeutic. Also, people who have never used art before may develop a strong desire to further that new found creativity. That is a very exciting journey! There are many positives to using and making use of colouring books. We are living in an age where technology is developing very quickly. It is good to see that a book that is made of paper and using a medium such as a pencil has taken off in a big way. We seem to be making time for tactile activity. Colouring books have a place in our lives. As as an Art Therapist, nothing gives me greater pleasure than to see people express themselves creatively. But I do not feel that using colouring books is Art therapy. 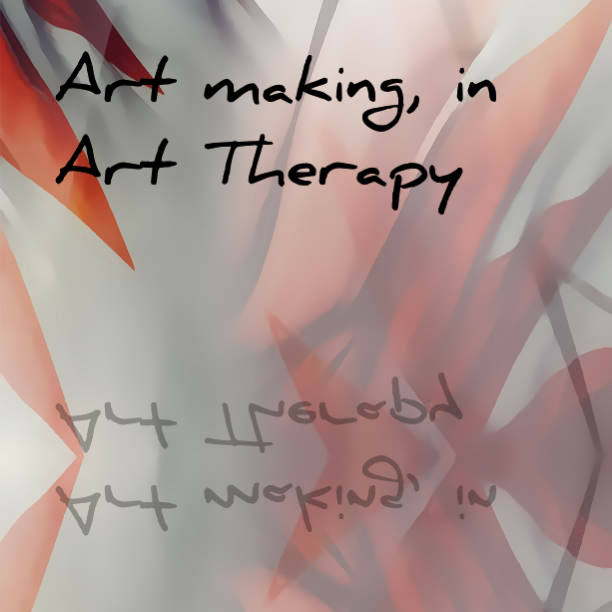 Art Therapy is facilitated by a trained and qualified Art Therapist at regular times. Therapeutic guidelines must be adhered to for the safety of the client and Therapist. The creations come from the person using Art Therapy, unless the Art Therapist provides themes or props to the session. The Art Therapist has an understanding of how creativity helps to facilitate change in a person. Art Therapy helps adress an issue, or several issues, in a safe space. Relationships are formed. The creations are spoken about and feelings about the artwork are discussed where possible. We, as Therapists are privileged to be invited into the client’s creative world. We gain insight into how the person is feeling through the art work. It would be interesting to find out how Arts Therapists feel about colouring books. Drama Therapy, Music Therapy, Dance Movement Therapy and Art Therapy are all registered professions with the Health Care and Professions council in the United Kingdom.